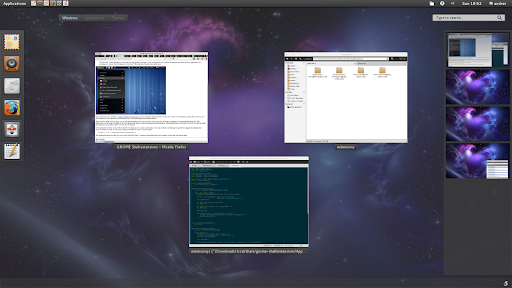 Ron Yorston has created some pretty cool GNOME Shell extensions that "provide a user experience more akin to that of GNOME 2". Using these extensions you can move the clock next to your username, get an old-style menu, disable dynamic workspaces and place the favourites on the top panel. Move the clock: moves the clock to the right of the top panel (next to your username). Favourites in the panel: places your Dash favourites on the top panel, next to the Applications button. Running applications won't show up here (unlike Dash) though. 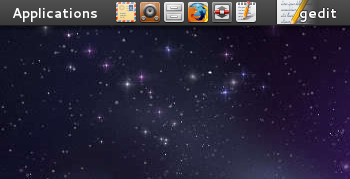 But for that you have the official Gnome Shell "dock" extension. Applications menu in the panel: the Activities button is replaced with an "Applications" button and will no longer take you to the Activities overview (you still have the top left corner hotspot for this) and instead it will launch a nice app menu. 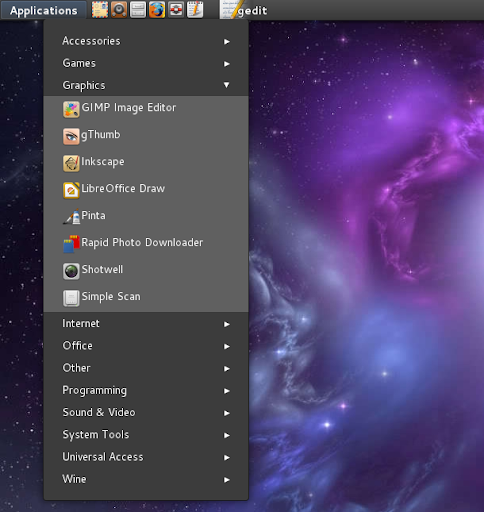 But unlike the old Gnome 2 menu, this one comes with collapsible entries so you'll have to click each category instead of hovering. Disable dynamic workspaces: a very useful extension for those who want a predefined number of workspaces instead of dynamic workspaces. Remember to change the number of workspaces using gconf-editor (apps > metacity > general > num_workspaces). Even though the extensions are provide as a pack, you can of course install only those that you want. Before proceeding with the installation, please note that I've only tested these GNOME Shell extensions with the latest GNOME Shell from GIT (build as of today). They should work with older versions but I'm not sure what's the minimum required version. Then reload GNOME Shell or log out and log back in. Or, if you want to install them manually, download the extensions from HERE, extract the package, press CTRL + H and you should see a hidden ".local" folder wherever you've extracted it - there, navigate to .local/share/gnome-shell/extensions/ and copy the extensions to the ~/.local/share/gnome-shell/extensions/ folder. Thanks to Charles Bowman for the tip!